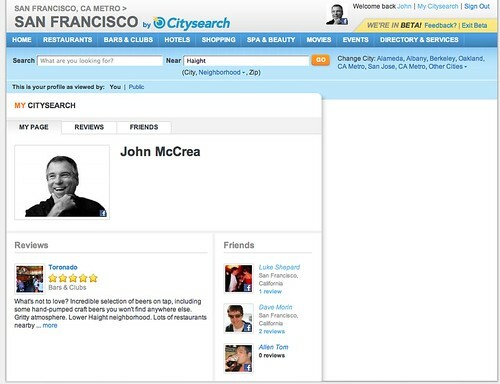 CitySearch relaunched today, with a sweeping makeover that is my favorite Facebook Connect implementation so far. You should check it out to get a glimpse into the near-future emergence of the Social Web. 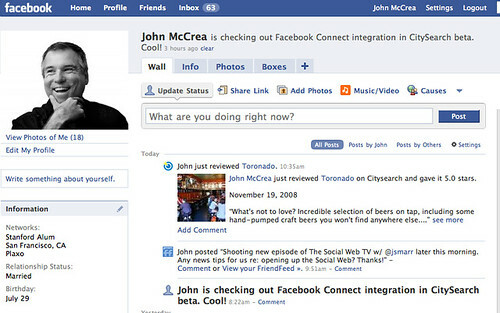 I used my Facebook account to create a CitySearch account in a just a few clicks. I saw some of my Facebook friends were already there. I checked out their reviews. I got inspired to write a review, too (of Toronado, one of my favorite pubs in the world). And I agreed to have that review (and future ones) shared on Facebook. And that should power a virtuous cycle of discovery, adoption, and sharing. Congrats to the CitySearch and Facebook Connect teams. Well done! Thanks John! Appreciate the shout-out. Citysearch is also one of my favorite implementations yet – “reviews” has sort of been one of our archetypes for Connect sites, so I’m really glad to see it launch.